You have long hair and you love it, but sometimes when you see a beautiful bob or lob (long bob) you can’t help but get the feeling you want to cut your hair off. It’s great to change your look but here’s a way to have a short hairstyle without the commitment. Take an inch-wide section at the nape of your neck, braid it and pin it up. This is going to be where you secure the rest of the hair up when it’s time. Brush out your hair with a boar bristle brush or wide tooth comb to create the soft finger wave. Tie all your hair back leaving ¼ of your length below the hair tie. Hold the hair tie and bring it up to your braid you created at the nape of your neck and pin your hair to the braid. 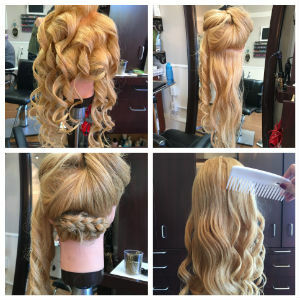 You can try this technique with curlier hair or crimped hair, get creative. 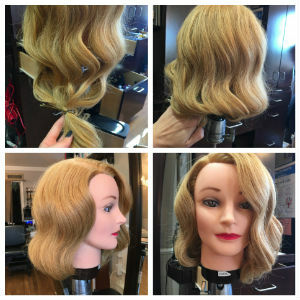 Use the same steps just switching up the texture of the hair.